Physics Buzz: Twice in One Night?? Shroedinger's Cat made two appearances on prime time TV last night. Uncalm already mentioned the first reference on The Big Bang Theory, where Sheldon used the infamous cat quandary to help Penny decide if she should go on a date with Leonard (...the cat's alive... whee!!). Over on the Fox network, the nerdy "squint squad"(a sometimes affectionate term for the scientist characters) on Bones needed our favorite cat to help a team member understand the confusion over a crime scene. 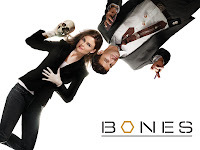 In typical Bones fashion, this shout-out to "geek-lore" was dropped in so seamlessly, that I had to hit the quick rewind on my DVR (the PhysicsBabe could not survive without her DVR). Cam: "It's a pickle. The platform is a crime scene, but we need to access it to investigate the crime." Zack: "Is it a cake or is it a pickle?" Zack: "That makes sense to me. Cakes and pickles mean nothing to me."